As a young adult Catholic, Erica Heinekamp has experienced different challenges to living her faith—starting with the uncomfortable situation she faced as a college student. She has also endured challenges from fellow Catholics at the parish level. In both instances—during college and after college—Heinekamp’s experiences reflect some of the challenges that many young adult Catholics face in living their faith. Her experiences also offer a glimpse of one of the most driving forces in their lives—the desire to belong. As part of the 18- to 35-year-old age group, young adult Catholics long for friendships that connect them. They want to be loved and give love in a deep relationship with another person. They also seek a faith that sustains them, creates a community for them and brings them closer to God. Father Rick Nagel has witnessed that desire as pastor of St. John the Evangelist Parish in Indianapolis, a parish that has great success in attracting and supporting young adult Catholics. “It’s been a surprise for me in this ministry for young adults of how important it is to create community,” Father Nagel says. At 27, Katherine Seibert echoes that longing. “Young adults are trying to find a place, and establish their life and their faith,” says Seibert, a member of St. Michael Parish in Greenfield. While the desire to belong is strong in young adult Catholics, so is the archdiocese’s desire to connect them more closely to their faith, according to Matt Faley, the archdiocese’s director of young adult and college campus ministry. Heinekamp reflects that approach in her life. So does Scott Seibert, the husband of Katherine Seibert. Yet Heinekamp, the Seiberts and other young adult Catholics who live their faith deeply are in the minority, according to a 2010 study by the Knights of Columbus and the Marist College Institute for Public Opinion. The study noted that just 25 percent of young adult Catholics attend a religious service at least once a month. It’s a challenge that the archdiocese’s office of young adult and college campus ministry is trying to overcome. It has established an active ministry at 10 college campuses in the archdiocese, with two more in the works. It has also begun to work with parishes to create an active, young adult presence. Nineteen of the archdiocese’s 147 parishes are on board so far. There are also programs that include small group studies, First Friday prayer services and Theology on Tap, a program where young adults meet in non-traditional religious settings, such as bars, to hear speakers talk about their faith and the Catholic approach to life. A Catholic intramural sports program in Indianapolis and Theology of the Body programs are also planned for the fall of 2013. Overwhelmingly, the programs and approaches are designed to create a feeling of community that can lead to a deeper relationship with God. Heinekamp knows the importance of that connection between community and faith for young adults. As her faith was being tested in college, it was also being supported by young Catholics who are part of Communion and Liberation, a lay movement within the Church that views “the presence of Christ as the only true response to the deepest needs of human life,” according to the movement’s website for the United States. 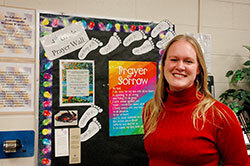 So did Father Nagel after she struggled to find a parish where she felt welcomed and needed. Father Nagel needed help at St. John the Evangelist Parish when he started a 7 p.m. Mass on Sundays for college students and young adults. Heinekamp offered her assistance. She also leads the Indianapolis chapter of Communion and Liberation, which meets every Monday at 8:30 p.m. at St. John’s. And she’s the fourth-grade teacher at St. Susanna School. 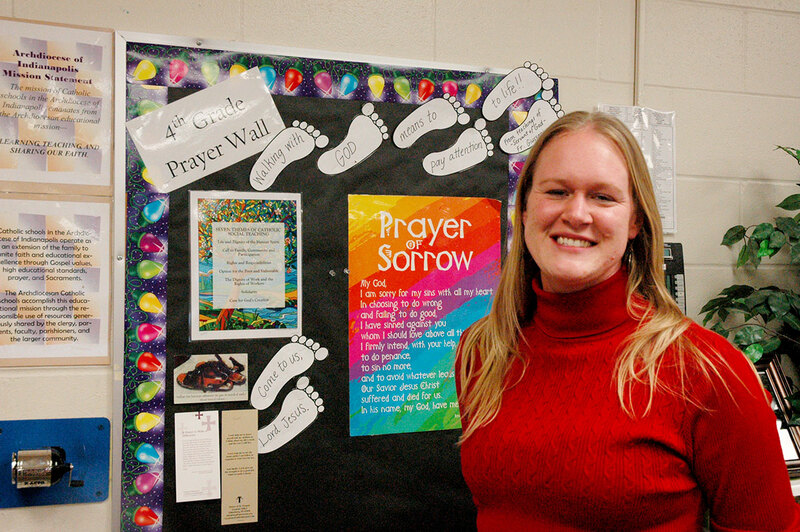 “The most tangible example of living my faith in my everyday life is with my students,” she says. “They need my affirmation. They need my care and support. Communion and Liberation has taught me that we all share these core needs to be affirmed, to be loved and to belong. That need for connection runs deep in her generation. “It’s important to provide us with a community,” Heinekamp says. “A lot of us might be living on our own. We don’t have a family nearby to go back to. A lot of the reason St. John’s is successful is because it builds community. There are a lot of social events. After Mass, a lot of us go out to dinner together.